Click to review either our Naples, FL location or our Fort Myers location. "I had my front passenger window shattered during a break in. I took the car into Beverly Hills to see about getting that window tinted to match the rest of the car. The young lady running the office was great, knowledgeable and efficient. The guys were able to do the window while I waited. I used Beverly Hills Tinting back in 1994 and that was the last time I had been in there. It's nice to see a business last that long in Ft Myers. Thanks Beverly Hills." "Best tint in town. Been using their service for more than 10 years. Quality is excellent and they warranty their work. Just had a 2000 Excursion redone free of charge just like they state. Couldn't be more happy with their service and quality of work.... Will keep going to them for future vehicles...."
"Great tint, last 2 cars were done here, i would recommend them to anyone." "Beverly Hills Window Tinting & Treatments did a great job on our blinds. We had an awesome experience and will be using you guys again in the future. Thank You for the great customer service." "My windows have not been tinted as yet, but I wanted to say what a nice employee Tim Brooks is. He is honest, answered all my questions. He was very knowledgeable about the product and even went the extra mile to send me a thank you note. So far your company treats a customer like many businesses used to do. I cannot praise Tim Brooks enough. Thanks again." "When I wanted Window tinting AND Pinstriping on my new pickup truck, I called Beverly Hills and found the right place. Professional and friendly service; at the best price!" "Hi Chris, I just wanted to let you know how happy we are with the tint job that your company did today at our house. My husband said the entire experience was great! It’s unbelievable the difference it makes at the end of the day with the sun beating in. I really appreciate everything you have done and you will be our only call when we need more work done. We can definitely use our cars tinted! Thank you again for everything, job well done!" 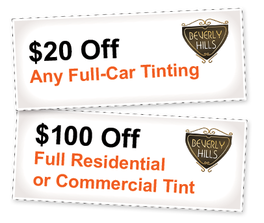 - Rob and Erin S.
"The crew at Beverly Hills Window Tinting does not just provide you a service. They make it personal, and treat you as if you're family. 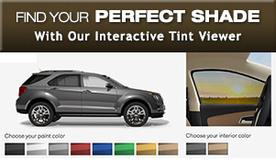 I was a little bit worried when I saw the display model of what the "darkest legal tint" would be. But after being referred by multiple friends, I put my trust in this company. My car looks amazing, even better than I expected it to be. I will definitely be referring my family and friends, and will be bringing future cars here! Gary was awesome!" "Jo Ann, we cannot thank you enough for the great job you did on our window coverings. Everything looks phenomenal and better than we could have ever expected! You were also a true pleasure to deal with, making our selection process and the installation seamless. Should you ever need a reference, please do not hesitate to provide our contact information." "We had our new car's windows tinted this morning at your establishment and we were more than satisfied with the professionalism and the job done by all of the personnel. We were taken care of immediately and in less time than expected. We will certainly sing your praises when asked for a referral." "Want to give a big big shout out to Tim who worked us into a very tight schedule. Also want to give a huge thank you to David for such a fantastic installation. What a professional. ......he kept us informed of the process at all times, was very safety conscious and took great care while in our home. You are very fortunate to have such great employees. Thanks. "I just wanted to share the positive experience I had this morning getting my home windows tinted. Angie, of Beverly Hills Window Tinting, called 30 minutes prior to our appointment to confirm that they were on their way and arrived on schedule. Once there, David walked me through the process, so I'd know what to expect. They were very kind and helped me remove a piece of wood that was placed between our baby gate and the sliding glass doors. David and Angie worked together like a well oiled machine. They were professional, efficient and cleaned up as they went. You could tell they knew what they were doing. My house was spotless when they were done. They helped me re-install the gate at the top of my stairs and made sure that it would not damage the newly installed tint. Before they left, David explained what to expect as the tint dried over the next 30 days as well as the best way to ﻿wash tinted windows﻿. I'm so glad that I hired professionals to do the job. I would recommend Beverly Hills Window Tinting to anyone. Great service and results!" "I recently had your bid for residential window tinting and agreed to the subsequent installation. So far, we are happy with the installation of the tinting, the blocking of the sun glare and heat. The installation was completed on the day that was scheduled. I wanted to tell you that the installation crew, David and Gary, did the work in a friendly, courteous and professional manner. They replaced my window treatment and the furniture that had to be moved to accomplish the installation and cleaned up any residue from the work. Good all around job." "I was impressed by the punctuality as well as the cleanliness of the club after your staff left, not to mention the quality of your work." "We are very pleased with the recently completed window tinting project. Thanks again for a job well done." "I had Vista safety protective film installed on my windows in September 2005. I installed this film instead of installing hurricane shutters. On October 24, 2005, Hurricane Wilma struck Naples, FL…"
"The window treatments are working very well! Your instal team came and went and we hardly even knew... "
"We are very pleased with the recently completed window tinting project…." "I was impressed by the punctuality as well as the cleanliness…"
"I wanted to touch base and thank you for the exceptional service we've received from your team…"
Naples Commercial Tinting - An Outstanding Job! "Your team performed a truly outstanding job! We feel more safe and secure because people cannot see in quite as easily and…"
"The installation of 8 mil Llumar security window film was completed last month as per your quotation and schedule. As you know, I am very particular…"